I’ve been using the beta version Line2 app from Toktumi in conjunction with their phone system for a few months now and I have to say it rocks. I was really excited about Google Voice, which is still a nice consumer app, but the Toktumi/Line2 combo is a real business solution. The base Toktumi virtual PBXgives me the power of a traditional PBX system (which we had an internal Asterisk system but Dillsmack threatened to quit if he had to keep maintaining it) with auto attendant, extensions, etc. plus new calling features like simulring, which rings any or all of my phones at once – office, cell, home, whatever – call handling – this person goes straight to voice mail, this person goes to office and cell, this person goes to straight to cell and home, etc. On top of that I get unlimited free calls throughout the US/Canada and some dirt cheap international rates, like $.02/min plus instant conference calls for up to 20 people all for only $14.95/month. Oh and did I mention they let me pick an 800 number, local number or transfer an existing number, pretty sweet. If that was it I’d still love the service but what really rocks is the Line2 app and the desktop sharing. For a few extra bucks I added the unlimited desktop sharing, which means no more annoying conference calls where I’m trying to explain to my designers what I want changed on the web site design. I just share my desktop with them and use the annotation tools to show exactly what I want changed. The best part is it’s all online so no clients to download and setup, if there’s something I want to show I just point them to the Toktumi site and give them a login #, that simple. I can even record the whole thing on video. We were using another service for this, but Toktumi is better and more integrated. The capper though is the Line2 app,which was just approved by Apple for the iPhone. There’s also a Blackberry version. Line2 adds my Toktumi number, voicemail, contact list, all onto my iPhone. So if I want to call from my “office phone” I just open up the Line2 app and dial. My Toktumi number is shown in the caller ID. Voicemails are separate from my AT&T personal voicemail but it has the same visual voicemail interface so I can listen to what I want and ignore the rest. Probably my only complaint about the whole thing is that I really like Voxie voicemail transcription, and they don’t do that but I think they are adding it. I was never a fan of apple until I got my 3gs and found all the wonderful aps. I have been using this ap and have to say I love it for my business as well! Anybody will love this if they will get so many facilities and advantage. That also at cheap rates. Certainly who says that prices of everything is rising just look at the telecom sector and you will see only falling of rates and increase in the quality level of services. Couldn’t agree more, I’ve been using them since the start of the year. Great service, just started using the Blackberry Line2 app and it’s very cool too. Great timing on this because I’ve been looking hard for a place to port my vonage number over to. However, I signed up using the top link (there was no link where you say ‘click here’) and was never presented with a place to enter the given code during the sign-up process. So, I signed up through your link, but how do I get the 3 months free deal? “Click Here” doesn’t work.. I went to the site to sign up, but not sure where to put the code.. ?? during check out after you enter in the billing info. the 14.95 price defaults to zero. We are currently using gotvmail.com and google voice, but this solution looks very promising. Great Price Too! Just signed up for Toktumi’s 2nd line. It’s AWESOME. I have two lines on my iphone now – one for personal and the other is for biz. Great service – allows me to carry only one phone and best of all, I avoid having to sign up for a new service agreement via AT&T. Cool… I still dont like apple or any touch phones though, but its pretty cool that they have versions for other phones. That seems a cool application. That would be awesome to use. I’ll check it out. Thanks. P.S. : I have fourth one as well, but its unofficial: your review. I used to work on desktop sharing products and they have never really taken off the way they should, they are just so useful and eco-friendly (they cut my transatlantic work travel in half). Always happy to see a good new one on the market. Interesting. I use RingCentral now purely for 800, voicemail to email, and fax to email. But I’ll check this out. It’s crazy … You can even find the address by a simple phone number.. Wonder what’s gonna come next ? Will you be angry if i don’t agree? 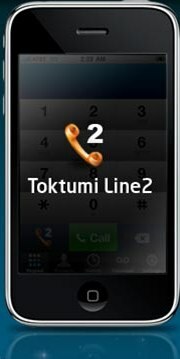 Toktumi doesn’t have the cheapest available rates in the market for international calling. However, their services are commendable. Thank you for the terrific article. RingCentral seems to have more features than Toktumi, except the Toktumi desktop sharing (I wish it could share with more than 8 people, though). Could you compare Toktumi with RingCentral and Vonage (and maybe Google Voice)? Are there any systems that could just be used as local numbers to forward calls?